New York (TADIAS) — If it was up to the Ethiopian migrants — who last week were savagely attacked, beaten, robbed and killed amid a mob of violence targeting foreigners — the Saudis would have been stripped of their seat on the UN Human Rights Council. It makes a mockery of the international organization that Saudi Arabia was elected to the position the same week that thousands of non-Saudi nationals were being hunted and several murdered in the streets of Riyadh. It’s a shame that Saudi Arabia, now a member of the world’s highest rights monitoring body, gets to make human rights decisions at the global level despite the fact that to date it has refused to let U.N. investigators visit to check alleged abuses. The New York-based Human Rights Watch describes the oil rich kingdom as an enemy of minority rights and political freedom. The Saudis, however, are not the only ones to blame for the continuing plight of Ethiopian citizens inside their territory. It’s unfortunate that the Ethiopian government also failed to take advantage of the amnesty period to properly register and account for its nationals as Pakistan has done. Pakistani Ambassador Muhammad Naeem Khan told Arab News that more than 700,000 of his country’s citizens have been legalized by Saudi Arabia ahead of the November 4th deadline to avoid forced deportation. “The embassy has created 80 different focal points all over the Kingdom to help illegal workers register” Ambassader Khan reported. What effort did the Ethiopian embassy make to register its citizens and provide access to legality or else repatriate Ethiopians before the amnesty expired? 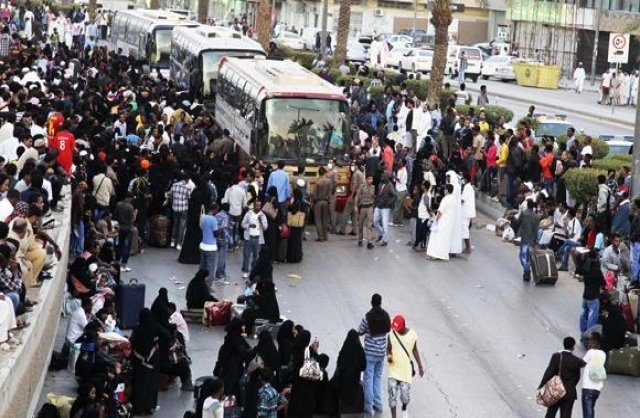 Even now, the Saudi government has stated that it will continue to receive adjustment applications from migrants as long as fines are paid given that they missed the amnesty deadline. Do representatives of the Ethiopian government in Saudi Arabia have plans to assist detained migrants given this leeway? If Pakistan can get 700,000 of their nationals registered there is no reason why Ethiopia can’t do the same for a much smaller migrant worker population. The matter is complicated by the fact that in most Gulf states, including Saudi Arabia, having an official sponsor is a legal requirement. According to Gulf News: “nearly a million migrants — Bangladeshis, Filipinos, Indians, Nepalis, Pakistanis and Yemenis among them — took advantage of the amnesty to leave when they failed to guarantee a sponsor. If Ethiopia chooses to repatriate all non-legal migrants it must do so in a timely manner, as those detained are facing risky and life-threatening conditions. On the ground, this is a time of intense difficulty for many Ethiopians and their families. We are encouraged by the collective efforts of Ethiopians worldwide to bring about global awareness, as well as government efforts to open an investigation into the deaths of three Ethiopians and repatriation of a few hundred so far. However, tweets and press releases may not be enough. We urge a united public engagement among Ethiopians both at home and abroad to close this sad chapter in Ethiopia’s modern history. We watched the videos and photos depicting unimaginable human cruelty, but we cannot imagine what it must have been like for those stranded after the amnesty expired and who found themselves being chased by armed gangs. And how about their relatives who watched in horror from afar? We call on the members of the United Nations to urge Saudia Arabia to adhere by the Universal Declaration of Human Rights especially now that they are a UN Human Rights Council member. We also call upon the Ethiopian embassy in Saudi Arabia to take up collective responsibility to work to register its citizens and assist them — as other nations have for their people — in adjusting their status, or voluntarily repatriating them in a timely manner so that they don’t continue to languish in detention.